Hospo Voice members and supporters who have been organising to combat wage theft were happy to hear on February 28 that the Fair Work Ombudsman had decided to investigate Le Bon Ton to ensure it is complying with Fair Work regulations. An estimated 7000 childcare workers took industrial action by walking off the job around Australia on September 5 to demand equal pay. In the biggest union mobilisation in Australia in more than a decade, up to 120,000 unionists and supporters descended on the streets of Melbourne on May 9. The protest was organised as part of the Change the Rules campaign. The rally followed a mass delegates meeting in April and was the conclusion of nearly a fortnight of union actions across the country to launch the campaign. Thousands of early childhood educators around Australia walked off the job for the third time in 12 months on March 27, as part of the ongoing Big Steps campaign for equal and professional pay. The walk-off came about because of the federal government’s failure to meet the February 1 deadline educators and their union, United Voice, had set for a response to their demand for a fair pay increase. 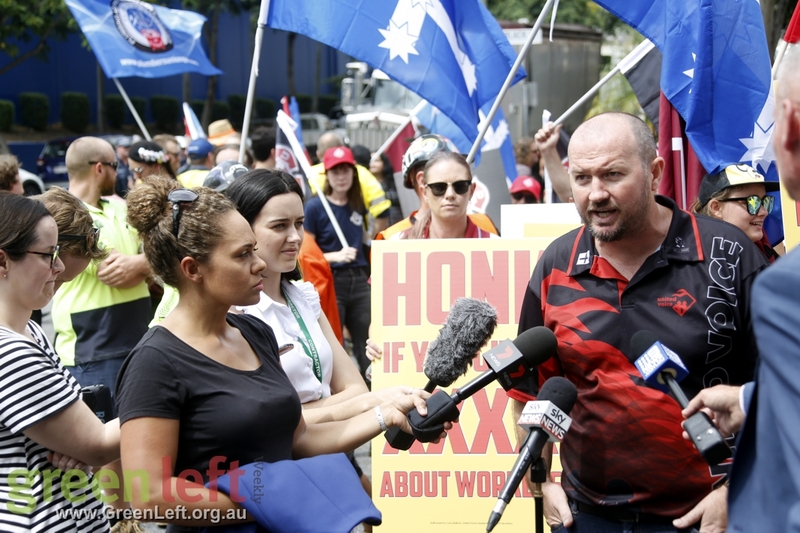 United Voice members working at the XXXX brewery in Brisbane stopped work for one hour, supported by other unionists and community members, on March 26. United Voice has lost a five-year equal pay case after the full bench of the Fair Work Commission ruled on February 6 that they had failed to show early childhood educators were paid differently to men performing work of comparable value. Workers at the PPG paint manufacturing plant at Villawood have been locked out for more than three months in a bitter dispute over pay and conditions. The multinational company, which makes Taubmans, Bristol and White Knight paints, locked out 57 workers on August 10 after they refused to cancel legal industrial action during negotiations for a new enterprise agreement.